14006: Custom Goat Skull Grille with Sword. Wow! Amazing! Unbelievable! is what you will say when you see this item in real life! 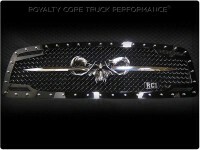 This extreme high quality precision made universal grille logo will fit any large custom mesh or billet style grille. Made from thick 12 gauge top quality T-304 stainless steel, it is manufactured in 3D with air brushed finish for realism and is intricately CNC machined for perfect detail and quality. Measures approx. 35.6" wide by 6.75" tall or can be custom made to your size specs. Attaches securely using stainless welded threaded studs on backside. Comes complete with stainless hardware. Can not be removed without opening hood. Grille sold separately. Backed by manufacturers lifetime warranty. Made in USA. (Please allow about 2 weeks in manufacturing before shipping). Speared Goat Skull with Airbrushed Realism. Swords are actually tapered and chrome polished. Gloss black back plate behind skull for darkened areas. Intricate 3D Machined with unreal details. 35.6" wide by 6.75" tall. 10/32" studs welded behind logo for secure mounting. Tell your friends about the Universal Grille Logo - Custom Goat Skull with Sword. Share this product on Facebook, Twitter, MySpace or send an email to a friend!